Fig. 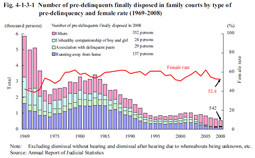 4-1-3-1 shows the number of pre-delinquents finally disposed in family courts and female rate since 1969 (See Appendix 4-7). The number of pre-delinquents finally disposed exceeded 3,000 in the earlier part of the 1980s, but then generally continued decreasing, and was 542 in 2008 (down 123 from the previous year). The female rate remained within the range from 50 to 65% since 1976 and was 52.4% in 2008 (down 0.4 points from the previous year).